Whitehead’s novel focuses predominantly on Cora, a young slave. When we first meet her there’s no getting away from the fact that this is a girl who has it tough. As with any novel focusing on slavery there is a lot of horrific detail here. Unflinching in brutality, Whitehead does not hesitate to show us the grim reality of life for many simply because of their skin colour. For anyone interested in this period, the book will undoubtedly be of interest. We follow Cora as she grows into womanhood, and watch her as she decides to trust Caesar, a recent arrival, who persuades her to try and escape. There’s plenty of literature around that shows how harshly escaped slaves were treated, so it is no surprise to se how fiercely Cora fights for her freedom. However, when she kills a young white boy who attempts to capture her it is evident that Cora is going to need some luck if she is to survive. 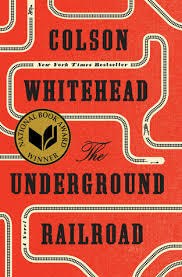 In this novel the Underground Railroad is not simply a metaphor for those who helped runaway slaves – it has been transfigured into a literal network of tracks that cross Southern America. Watched over by sympathisers to the cause, the Railroad becomes Cora’s means to an end. Following its tracks, Cora crosses state after state – trying to escape the slave-owner desperate to have his property returned. This device also acts as an easy way in for a number of characters to feature in Cora’s life. Where I found the book less successful was in regard to the sprawling nature of the content. There were a lot of characters dealt with, some of which were portrayed very superficially. At times, I’d have liked to follow one or two characters in more detail but this was ambitious in tone and it’s clear to see why many feel it hold a light to contemporary attitudes to race.